The book raises semiotic questions of human–animal relations: what is the semiotic character of different species, how humans endow animals with meaning, and how animal sign exchange and communication has coped with environmental change. 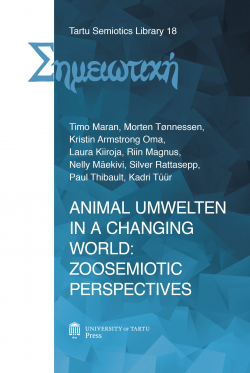 The book takes a zoosemiotic approach and considers different species as being integrated with the environment via their specific umwelt or subjective perceptual world. The authors elaborate J. v. Uexküll’s concept of umwelt to make it applicable for analyzing complex and dynamical interactions between animals, humans, environment and culture. The opening chapters of the book present a framework for philosophical, historical, epistemological and methodological aspects of zoosemiotic research. These initial considerations are followed by specific case studies: on human–animal interactions in zoological gardens, communication in the teams of visually disabled persons and guiding dogs, semiotics of the animal condition in philosophy, historical changes in the role of animals in human households, the semiotics of predation, cultural perception of novel species, and other topics. The authors belong to the research group in zoosemiotics and human–animal relations based in the Department of Semiotics at the University of Tartu in Estonia, and in the University of Stavanger in Norway.